Legal Advice Please - photographer not providing our products!!! We paid upfront for our wedding photographer. It's now 7 months since we got married and still haven't received our wedding album and prints. We did receive a disc of pictures but nothing else (some nice, some so bad you can't tell who it is). Anyway we've emailed and rung the photograher numerous times to try and complete our order but he still hasn't done it. We've now given him 2 weeks notice to complete our order otherwise we want refunding. Can anyone suggest what we should do i.e., trading standards, legal action, etc? Did you sign a contract, or anything that proves what services/goods you paid for? go to papers. this is a good sob story. i had an awful photographer, i told my friend about him on her hen night and she had booked the same one. it didn't go down well. I feel really sorry for you, i was so upset with my naff photos, i can't imagine what its like for you. have you anything in wiriting showing his service and any delivery dates etc? We've nothing in writing, just have receipts for what we have paid. It's certainly a consideration to try the papers but really all I want is what we paid for. It is a blessing I managed to get the disc off him. I actually chose this guy as he was recommended to me twice! go to papers. this is a good sob story.i had an awful photographer, i … go to papers. this is a good sob story.i had an awful photographer, i told my friend about him on her hen night and she had booked the same one. it didn't go down well.I feel really sorry for you, i was so upset with my naff photos, i can't imagine what its like for you. I would send him a final letter (by recorded delivery) demanding the goods that you have paid for by a certain date and state that if he does not respond you will take legal action. CAB should be able to help you (especially if you end up having to take him to small claims court ). Take any info (leaflets, brochures, receipts, letters) with you. Sadly we paid by cash as we paid for everything else on the credit card (doh). We've emailed him and had a response so I guess that could act as a recorded/proof of receipt of our intention? I am a photographer and an experienced photoshop user. It's surprising what you can do with sometimes what appear to be quite naff photos. Particularly if the pictures are in RAW format (which I have a feeling they are not) and of a highish resolution. Been in touch with Lancashire Post (local paper) and they don't get involved with 3rd party disputes. Spoken to Trading Standards and they say they'll get in touch within 5 working days. My photographer has now emailed me saying my canvases are ready - emailed back saying not even chosen them as we are still trying to sort out our album! We've nothing in writing, just have receipts for what we have paid.It's … We've nothing in writing, just have receipts for what we have paid.It's certainly a consideration to try the papers but really all I want is what we paid for. It is a blessing I managed to get the disc off him. I actually chose this guy as he was recommended to me twice! What do the receipts say, just the total cost paid? How did you decide on what services you wanted and the cost? If it was all discussed in person and you've only a cash receipt saying the amount that was paid then it's going to be difficult to take any legal route which I'd assume is a small claims court as mentioned already. As you've had some recent contact with the photographer hopefully you can get this resolved peacefully which will save you a lot of time and hassle. What don't you like about the pictures? I realise that is not an easy question, hopefully the person above may be able to help as I do agree that often poor shots can be improved considerably even without needing major alterations just with simple retouches and crops. As for your recommendations, different people have different standards - I've seen some wedding photos that are outstanding and have been clearly taken by an experienced photographer who knows his equipment and his craft well. But on the other hand I've seen wedding photos which the people are pleased with but to me at best are average or worse and poor for someone who offers themselves as a professional wedding photographer. Wedding photography can be very challenging as you're often dealing with very poor light and situations where's difficult to get a good position or angle. On top of that many of the shots you're only going to get one chance at which you simply can't muck up. For these reasons I don't like shooting weddings, I only do so if the person can't simply afford a professional photographer - while I've got a pretty good high end setup these days and feel my photos aren't bad I don't believe they're anywhere near a professional level and I don't mislead peope to believe so. Instead I show them examples of my work and if they're happy with that then I'll go ahead. Hopefully you'll get it all sorted out without too much hassle, good luck with it. Anyway, your predicament, I would just email the person saying, we want what has been promised, or you will file a claim to the small claims court within 7 days. I would also ask for media with ALL the photo files on there, you can do without canvases and albums, but the files are gold! - Some people like to hang on and hang on when it comes to dealing with customers. But even some of the worst put their butts into gear when the law gets involved. Papers are useless because they get so many people asking to print sob stories, they will only print something if they dont have enough news to print. I know its hard, but try reasoning with the photographer one more time, be as nice as you can be. It may pay off. If he has a website then you can research there what services he offers for what price, then you can evaluate what you should have got for what you paid -and could also be of help if you did take it to court to build your case. The same applies if he has a shop, you could get some information (or someone on your behalf) of what "packages" they offer and the price, maybe they advertise their services in some free local papers. Also go back, if you can, to those two people who recommended him to you just to query what they got at what price. Again they can support your claim. If he is a self employed / second job photographer it may be harder and most importantly we dont know how much you paid. Obviously if you paid 1K to just get a CD then I am sure you have a strong point and the court on your side but if you paid him £100 (to stand around all day to take pics / travel/ and so on) then is more understandable. The photographer has little brochures which shows the standard wedding package at a flat cost (which we paid for) we then paid for extras (to make the standard album larger and to buy the cd containing 500 - 700 photos). We have receipts showing dates and amount paid but no formal contract. We do have a disc of photos, some of which are really bad (i'll try and post a pic) and some that are nice so it isn't as though we don't have anything. My gripe is that i've paid £2000 and all i've got is a cd! I'm no photographer and have no idea what can and can't be done but surely in the photo above any decent photographer would have adjusted the light setting (on photoshop or the like) before putting it on a disc and giving it to me. He does use a decent camera Nikon D300. So hopefully he has the photos in RAW format. Your group photo is overexposed, which should be able to correct in raw. But more difficult in jpeg I believe. I hope you have some better ones than the two you have posted. How many on the cd? Any more to come? I did a wedding with a friend for someone in the summer, using a Sony A100, and it was the first time I had used it. I didn't get paid and was just back up to him but even pre-processing i don't think i had 50 photo's that were as bad as those 2, out of around 700. 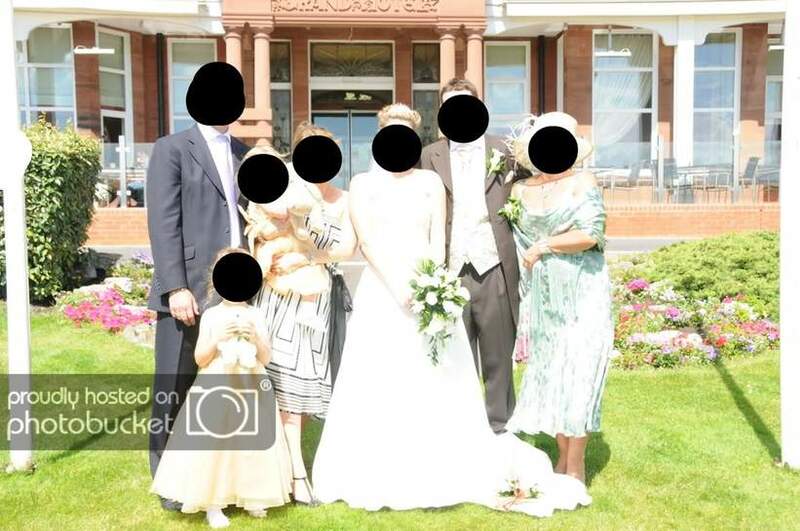 I wouldn't have even thought about giving them to the couple on a disk without fixing the over exposed one and the blurred one would probably have been deleted. tbh, I think you have been very reasonable and very patient. It's not a quaility I could say I have after seeing those photos. But I think it's time you went to his establishment and had a chat about everything, sometimes face to face contact can achieve more then e-mail contact. Also bring a friend (Pref. not someone of your immediate family or very close friend [As if you were trying to get your passport photo signed]) as a witness. P.S. Congratulations on your marriage!!! Blimey, no wonder you're unhappy - those pictures are the worst I've seen from a 'professional' photographer who doesn't seem to have a clue what they're doing. 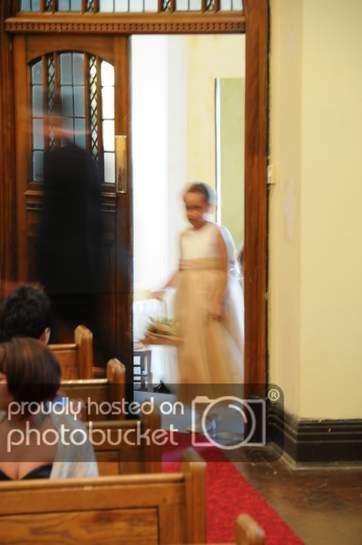 While even a good photographer is going to have poor pictures amongst good ones, those two both demonstrate very amateur mistakes - the shutter speed for the first one is far, far too low, if you're shooting indoors you need to bump up the ISO or use a flash if possible. A D300 can handle this with ease. The second shot is of course completely overexposed, bright white light that usually means dialling a bit of negative exposure and much of the highlights could have been recovered from a raw file although it really is very badly overexposed. As above I wouldn't have handed pictures like that over, the blurry one is completely lost. I assume all the files you've received are in *.jpg format? I think it would be worth asking for the raw version of the files (if the photographer took them, judging by the photos perhaps not) as they allow far more correction to be made. I'm in disbelief that a professional photographer charging a considerable sum of money would take pictures like that and even more so that he'd hand them over to you. The D300 is a good midrange body (and capable of far better results) but the lens choice is unbelievable, the superzoom 18-200mm lens is the last lens that should be used for a wedding as it's a reasonably cheap walkaround lens. It's not a particularly high quality lens both because of the low cost and the wide focal range, instead high quality zooms and prime lenses costing far more are the usual choice of a wedding photographer. My photographer has got in touch, no apologies or anything and acting as though everything is hunky dory! He has invited us to his premises to get it sorted (no date yet, so could be this time next year lol). Please could you advise me on what I should say/ask i.e., get pictures on RAW format, etc. ps. I don't have one good photo of our 1st dance as they are all blurred. Do you think RAW format could clear it up a bit? To save me asking you all these questions, is there a photography website were I could find out all this info? God! They're awful! I consider myself an amateur photographer and can quite safely say I can shoot photos better than those. ps. I don't have one good photo of our 1st dance as they are all blurred. … ps. I don't have one good photo of our 1st dance as they are all blurred. Do you think RAW format could clear it up a bit?To save me asking you all these questions, is there a photography website were I could find out all this info? Unfortunately badly blurred shots cannot be saved even if they're in raw format as the shutter speed was simply too low. The type of shots that can be saved or improved if they were in raw format is underexposed shots (too dark assuming not blurred), overexposed shots (such as the one above) or if they're shot with the wrong colour balance (where white is yellow or blue). There are plenty of sites that go over photography basics although I'm sure people don't mind trying to help you here, you're welcome to PM me (and others I'm sure) if you want more detailed assistance. Not only that-even if you do get your refund youve still only got your disk and not a massive album with your photies in Thats aweful really hope you get them tell us all his name so knowone else books him! Thanks John for your reply. I just wanted to some basic information so that when/if we get to meet him we can say, do this and that as we know that it can be done. He has god knows how many photos of us and only gave us between 500 - 700. In his initial photo album he put together of us on his website he chose photos we don't have copies of. When I queried them he blamed it on his secretary and said they didn't include photos on our disc which were of poor quality (so if they are poor why put them in our book)!